How can you take your budding home studio to the next level? Perhaps a drum machine is just what you need. There's nothing wrong with dragging audio files directly onto the timeline of your DAW (we all do it) but sometimes you want to get away from the DAW and just jam. Or maybe you'd like to complement your live setup with some additional rhythm. No matter your starting point, a drum machine can be an exciting and vital addition to any musical arsenal. In this article we'll walk you through everything you need to know to make an informed decision on what kind of drum machine to buy. We'll talk about the basics of drum machines, the different kinds available, applications, compare vintage and modern machines, and get into how to sync and record them. It's a lot to cover, so let's jump right in. Whether your drum machine is analog, digital, or sampling-based, programming it will likely fall into one of two categories: real-time or step-time. Real-time programming is just what it sounds like: programming beats live while the machine plays. Press record and hit the appropriate button in time with the rhythm. Don't worry if you play off time—most machines offer some kind of quantizing to align the sound to a subdivision of the rhythm. Step-time programming usually involves pressing buttons along a horizontal timeline to select playback position. For example, to program a typical four-on-the-floor house beat, punch in the kick drum at 1, 5, 9, and 13, and the snare at 5 and 13. Some machines, such as the TR-808, offer both kinds of programming. Older machines may have only step-time, and some primitive machines may not even have a timeline, forcing you to count out the steps and punch them in blind. There are advantages and disadvantages to each type of programming, but a machine that offers both kinds would be the most flexible. When programming, you usually create a pattern first. You can then chain patterns together to create songs. Some machines also offer variations on patterns and/or fills, which can be useful when performing. Lastly, we should mention swing. Swing (also known as shuffle) is meant to approximate a more human playing style, rather than sticking strictly to 16th notes, which can sound robotic. Swing can bring a little bit of groove to a beat or, at extreme levels, can add a jacking rhythm that was popular in house and R&B tracks in the late '80s. Every machine will swing a little differently. Even machines that don't offer control over the swing, like the Roland TR-606, will have their own built-in groove. This is another reason that working with drum machines can be rewarding and exciting. When choosing a drum machine, probably the first thing to consider is whether you want an analog or digital drum machine. Analog drum machines create their drum sounds with analog synthesis, much like a subtractive analog synthesizer. User controls are usually limited to things like release (how long the sound continues) or tuning. Some can offer quite a bit more control though, and this is attractive to musicians who like to perform and tweak their rhythms. Arturia's DrumBrute and DrumBrute Impact are good examples of analog drum machines with tweakability. 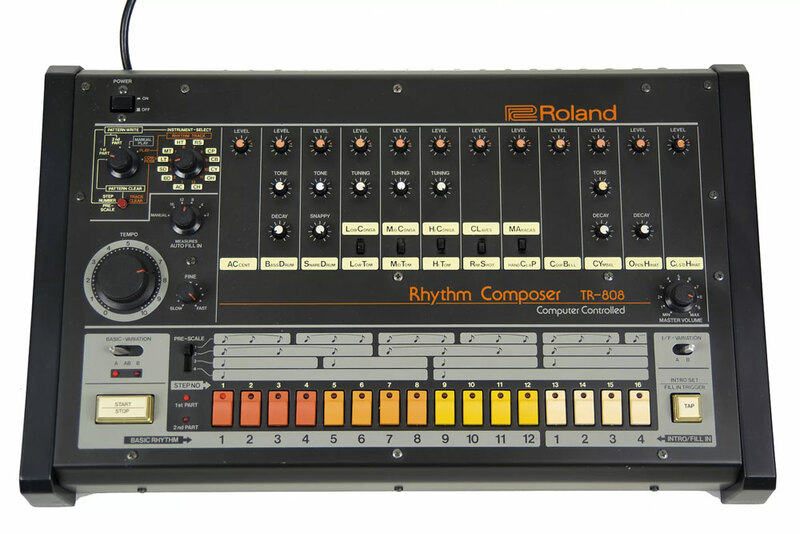 Traditionally, digital drum machines were based on one-shot samples of acoustic drums, and control over the sound was confined to panning, envelope (volume shaping), and tuning, if that. These days, digital more likely means analog modeling, and thus offers all the control of an analog machine with digital clarity. 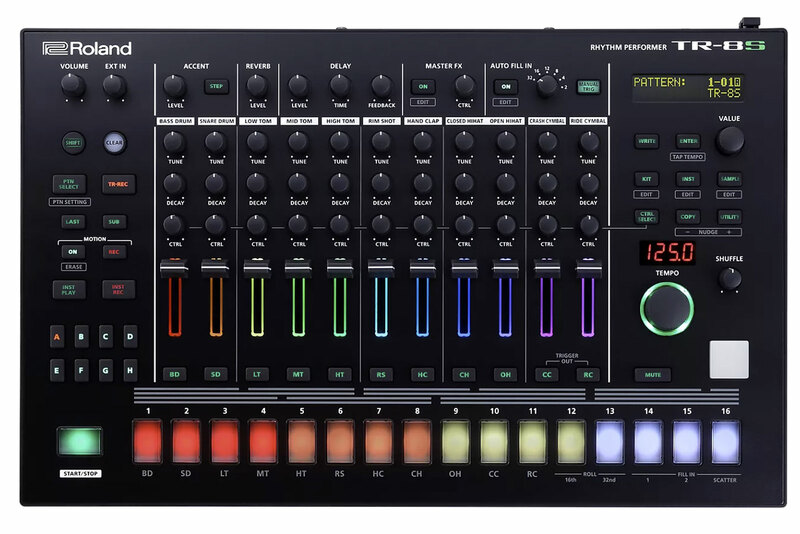 Recent drum machines like the TR-8S fit this bill. If you want to sample drum sounds from records, sample packs, or your own recordings, you'll want a sample workstation like an Akai MPC Touch, Pioneer Toraiz SP-16, or a Korg Volca Sample. There are also hybrids, like the Roland TR-909, that offer both analog and digital sounds, and digital drum machines with limited sampling, such as the Korg DDD-1 and Casio RZ-1. The number of outputs a machine has should also be a consideration when choosing your drum machine. The first drum machines had only mono out and, later, stereo. This is fine if you want to record your beats as one unified whole (or you don't mind muting and recording a number of passes), but if you want to record each sound individually for further processing and mixing, you're going to need multiple outs (or USB audio). If you plan on performing live with your drum machine, you may want to look into what kinds of performance features it has. Modern drum machines are made with performance in mind and so come equipped with features like beat repeat, global filter, randomization, and other ways to add variation and interest to the beat. Lastly, if you plan to do finger drumming, you're going to want to consider the playability of the pads. How (and where) you plan to use your drum machine will play a big part in which machine you should choose. Will you use it primarily in the studio? Perhaps you plan to use it in a live set. Or it could be that you want a machine for DAWless jamming. Let's look at each one of these individually. While expensive bells and whistles are certainly nice to have, if your primary concern for your new drum machine is getting a good-quality recording, you may want to forego the scatter effects and blinking LEDs in favor of something that will provide the best sound for your budget. If this is your goal you may even want to consider vintage gear. Many modern machines are effectively recreations of older machines, so why not go straight to the source and start a collection of vintage boxes for your studio? Vintage gear is prized for its sound, but because of its age it doesn't always survive the rigors of the road. If you plan to take it to the stage, a modern machine will be a much better option. The Roland TR-8S will get you that classic beatbox sound without having to worry about finding a tech at 7 p.m. on a Sunday to recap your dying 808. Also, the plethora of modern performance options are just begging to be employed live. A popular buzzword these days, DAWless jamming is just what it sounds like: old-school hardware jamming with nary a computer in sight. If this is your goal, you're going to want to make sure that your drum machine has the jamming capabilities that you need. It will be similar to live use but perhaps it doesn't have to be so hardy. A vintage machine could fit the bill but connectivity could be an issue, so make sure it will play nicely with your other machines (see below for more). This takes us to the elephant in the room. Should you buy modern or vintage gear? Aside from the differences laid out so far, a big thing to consider is vibe. By this we mean: what inspires you. If the music you make is rooted in a specific sound from the past and you just can't get enough of watching YouTube demos of classic gear, then a vintage machine could be the inspiration that you need. There's just something so satisfying about programming an original Roland TR-606 in good condition. You can feel a part of the continuation of music making that started in the early '80s and winds its way through all your favorite records. And don't forget, you don't have to break the bank to get nice, old gear. For every 909 there's a 626 or even a 505 that may inspire you without requiring too big of a sacrifice. However, maybe for you the important thing is not the lineage of the gear but what it can do. In that case, by all means go for something modern. The feature sets of many of today's drum machines are so vast that may be inspiration enough. Not to mention the hybrid combinations of analog, digital, and sampling. It really is an incredible time to get into gear. Like other electronic music gear, modern drum machines use MIDI to transmit note and performance information. If you plan to use a drum machine with your DAW and computer, you'll need a way to get that MIDI information to your machine. Some audio interfaces (like the Focusrite Scarlett 18i20) have in and out MIDI ports. Just connect a MIDI cable between the interface and your drum machine and you're good to go. If you interface doesn't have MIDI ports, there are plenty of MIDI-to-USB interface options, like the Midiman and the MOTO MIDI Express XT USB. Some modern machines have USB MIDI, which means you don't need to use a special cable at all. The MIDI information can be transferred directly from your computer to the drum machine via a standard USB cable. This is very convenient. So far so good, but where DIN sync gets tricky is when you try to use it with MIDI. Audio and MIDI interfaces don't work with DIN sync. 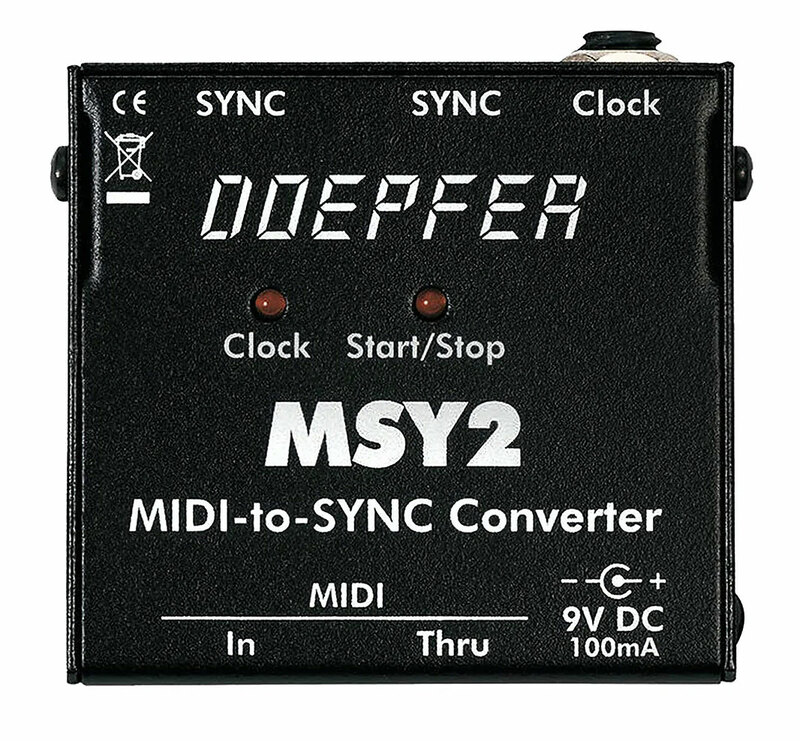 To make DIN and MIDI compatible, you'll need some kind of sync box to convert the clock information. Note that DIN sync won't accept note information, just clock start/stop. Another sticking point for DIN sync is the fact that Roland and Korg used different DIN sync standards. Roland used 24 PPQN (pulses per quarter note) while Korg decided on 48. If you plan to use both Roland and Korg DIN sync gear in your MIDI setup, you'll need a box that can handle it all. The vintage Korg KMS-30 does it without a hitch, as does the modern Roland SBX-1 Sync Box. Finally, some gear uses pulse to sync tempo. Anyone with a Korg Volca will be familiar with this. Some very old gear will have pulse sync capabilities but no MIDI or even DIN sync. This can be frustrating, particularly when the drum machine insists on being the master in the clock situation rather than the slave. If you're getting into modular synthesizers, your new drum machine module may have all kinds of interesting options for clocking and control. Recording a drum machine is a little more complicated than just recording a synth, primarily because you're trying to record a number of different sounds at the same time. If your drum machine has separate outs (or USB audio), you may want to take advantage of it and track each drum sound individually. This way you can maintain complete control over each discrete sound, applying EQ and compression individually as you see fit. However, in the same way that recording a drum kit with just a few mics can sound really fat, there's something to be said for recording everything from a drum machine in one go. And, unless your single-out machine has individual volume controls for each sound, you may not have a choice. You could try programming variations of the pattern with each sound isolated (or use the mute button, if your machine has one), or you could make the most of the full rhythm, allowing the natural compression of the signal to impart character. Or you could try recording both and using them in different contexts in the same track. For more, see this in-depth article on how to record drum machines. Elektron Analog Rhythm MKII: – Elektron is known for its high-quality and unique products. The Analog Rytm MKII isn't cheap but it offers a number of performance and sequencing features, plus sampling, so the possibilities are fairly endless. Roland TR-8S: – The sequel to Roland's popular TR-8, the S model adds sample playback to its already powerful analog modeling sound synthesis. Full of Roland's legacy sounds (think 808 and 909) and with the ability to play fills and variations, the TR-8S is suited to both live and studio work. Arturia DrumBrute Impact: – The slimmed down little brother to the original DrumBrute, the Impact offers nine analog drum sounds as well as an FM percussion generator. It also offers polyrhythms and per-track swing, making it a creative performance tool. Korg Volca Beats: – Part of Korg's Volca line, this mini analog drum machine has enough performance features to compete with machines at a much-higher price. And that kick. It only has one output, but it is very moddable. Alesis SR-16: Originally released in 1990 and recently revived, the SR-17 is a budget digital drum machine that can be found new for a very low price. With 233 sounds and some interesting features, if money is a concern then this may be a good place to start. Akai MPC3000: An upgrade of the original MPC60, the Roger Linn-designed MPC3000 is a sampling workstation with 16 dynamic pads. It also has an excellent sequencer and could pull double-duty as the brains of your DAWless studio. 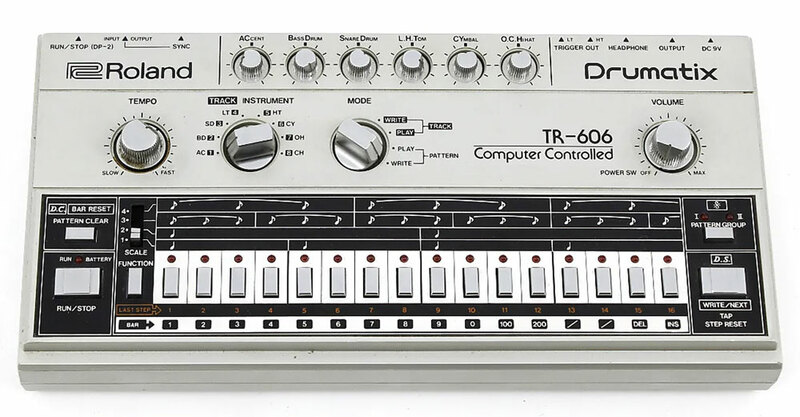 Roland TR-707: Roland's all-digital sequel to the hybrid 909, the TR-707 found favor with Chicago house producers in the late '80s. Although limited in sound, its multiple outs and individual volume controls make it a good vintage performance machine. Oberheim DMX:: While the Linn Drum was popular in pop and rock music, Oberheim's digital DMX made its mark in hip-hop thanks to Run-DMC and "Sucker MC's." The claps are instantly recognizable. Also check out the DX for more digital Oberheim power. Working with drum machines can be fun and exciting in a way that's different to other types of music gear. Perhaps because they're so immediate, it can be easy to get inspiring ideas up and running quickly. Also, because they're (relatively) small, they can be portable and easy to take on the go. No matter what drum machine you choose, you can be confident that it will bring a new level of excitement and immediacy to your music-making.